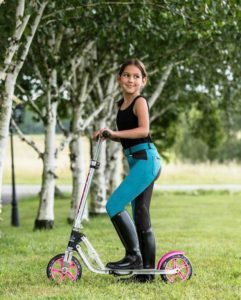 The adorable two-tone Kid’s Mia knee patch breeches are available in a variety of bright color combinations. The Mia breeches feature contrasting Euro seat, belt loops, and stitching details. There are two slide-in front pockets and two back pockets with small zippers and decorative accent embroidery. 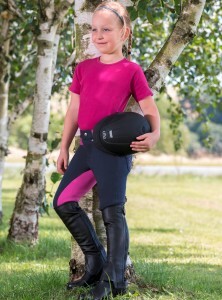 These breeches are both comfortable and fun!